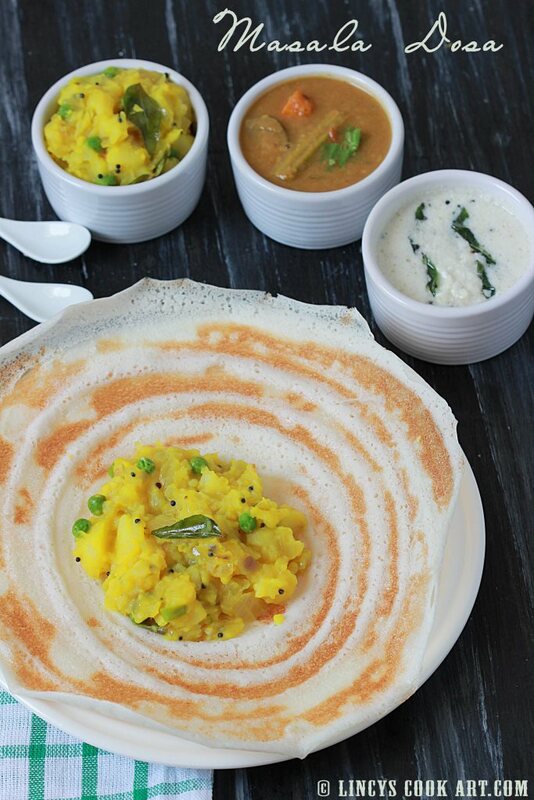 Masala Dosa is a popular South Indian Dish generally prepared for breakfast or an evening snack or dinner. The main reason for it being so popular in South India are its thick mushy potato masala with the crisp crunchy outer dosa. It is a common consumed comfort food in South India. It is also a known mood booster even pregnant women are found to crave for the yummy masala dosa during pregnancy. Not withstanding the above the masala dosa is the most largely ordered food on the menu in any vegetarian restaurants. Here i have shared the masala dosa recipe which we could prepare at home itself. Pressure cook the potatoes till soft for about 3- 4 whistles. Peel and roughly mash them. Heat oil in a pan; add the mustard seeds and urad dhal. Now add the mashed potato and(if you wish you could add grated Carrot or Green peas if you like for more colour and nutrition) turmeric powder; also add salt and about a cups of water. Allow the mixture to boil well and cook till the mixture starts to become mushy and thick. Cook according to your palatte. Because some likes to have pieces of potatoes in the masala some like it like in mashed consistency; switch off the gas once it is thick. Heat the dosa tawa and grease with oil and pour a ladle full of batter and spread with the backside of the ladle to make concentric circles. Drizzle half a teaspoon of oil on top of the dosa, once the top of the dosa cooks add a big scoop of the potato masala over the dosa and cook for fifteen seconds. 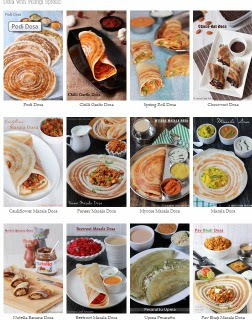 Roll the dosa or fold the dosa as you wish. Serve with any kind of chutney or sambar.